It’s always a privilege when I get asked to lead a technology team for a big church event. 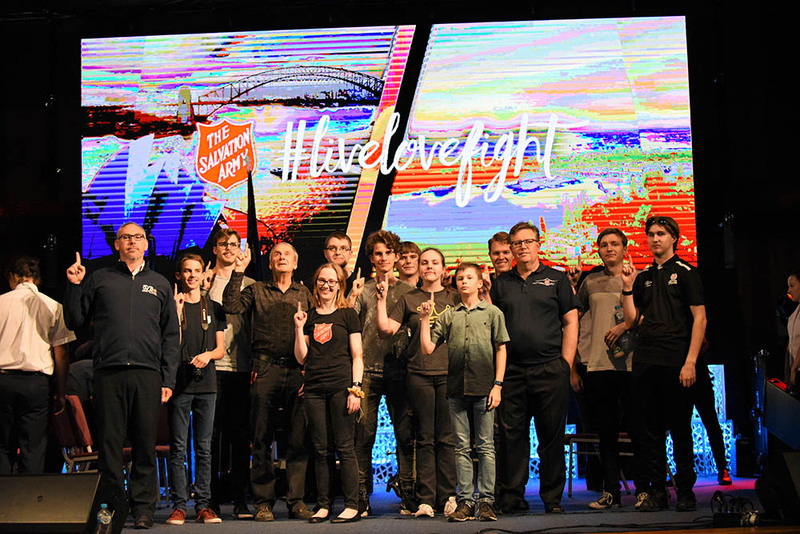 On Saturday 24th November, we held a Celebration Rally for The Salvation Army in NSW/ACT. 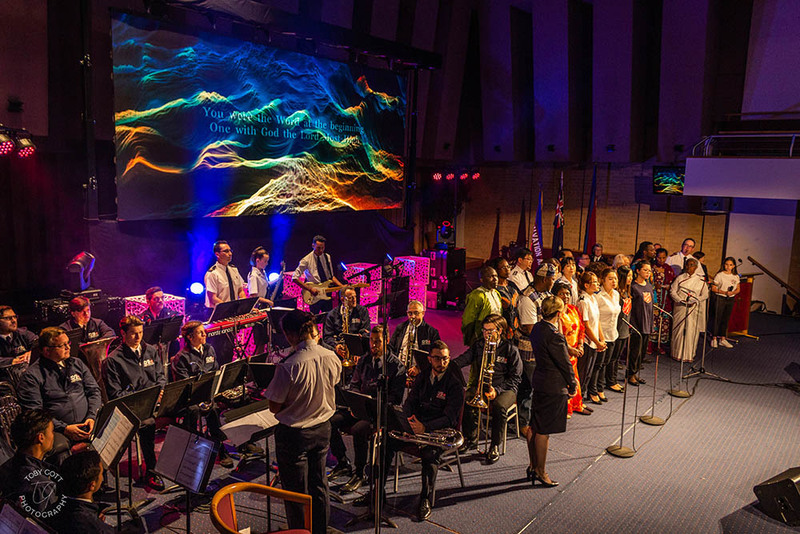 The event was a big deal – it recognised the years of ministry under the banner of the then soon-to-be defunct Australian Eastern Territory (now officially merged into an Australia-wide territory), and our international leader of the organisation (General Brian Peddle) was coming to Sydney to join us in this celebration. 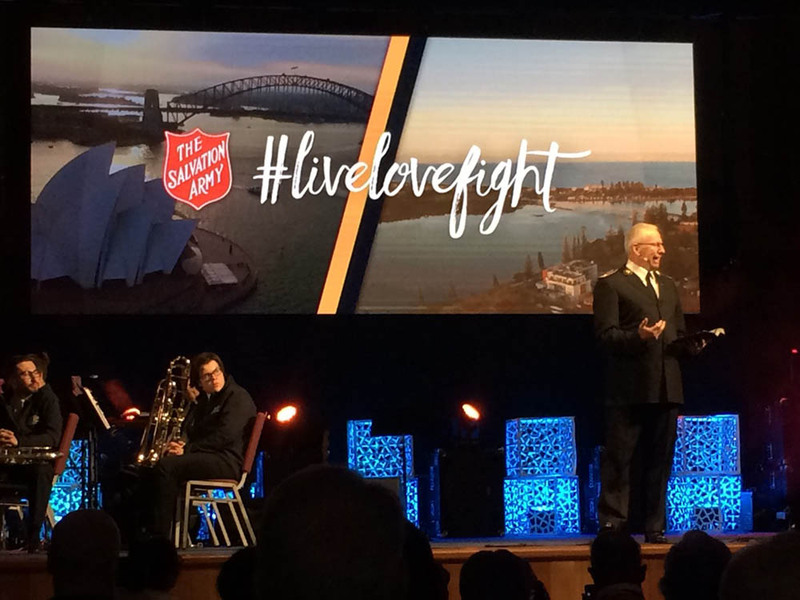 With the event being held at Sydney Congress Hall in Sydney CBD, I was able to bring together a volunteer team from across Sydney to produce this event. Many of the team members had worked together before on events such as Sydney Youth Councils. We’re trying to build a healthy tech team within our broader church, and this was a good opportunity to work together again and continue building that team. The volunteer team worked all day Friday for setup, Friday evening for music rehearsals, Saturday morning for further setup, Saturday afternoon for the final rehearsals, and Saturday evening for the actual event – before bumping everything out for that evening. They gave up work. They have up family time. They gave up the balance on their eToll account. This team, all fifteen of them, are awesome. As with several other recent events such as Youth Councils, we used Trello to organise the team ahead of time. Being a distributed team, many of us also met via Zoom video conferencing and chat via iMessage both before and after the event. We are deliberately trying to create a team culture that encourages inclusivity, positivity, and creativity. The budget was, as usual, tight. 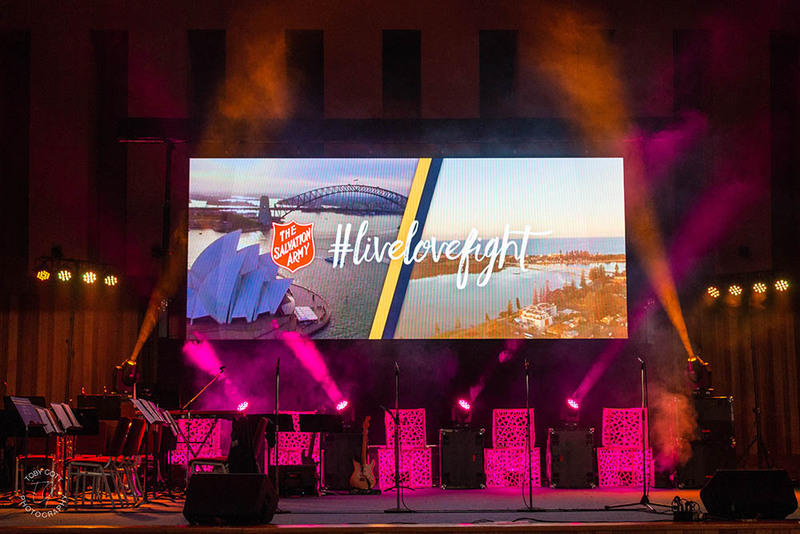 We hired an Event Pixels P3.91 indoor LED Screen from LKR Productions, which created a great creative backdrop for the event – measuring 6m wide x 2.5m high, and supported by tower lifters. This was complimented by a range of LED and conventional lighting fixtures, controlled by GrandMA dot2 and LSC Clarity. Audio was the in-house line array and under-gallery in-fill speakers, with separate FoH and Broadcast audio consoles. We also produced a live-stream. If you want to find out about some gory video details, read on. If you are just here for the event photos, skip to the bottom of the article. While I am very proud of the entire team, I want to particularly focus here on how we used video creatively in worship. I personally believe that properly executed audio, video, and lighting can really help people feel more comfortable and immersed in worship. For various reasons (usually cost-related), we don’t always do full-scale video for these events. In many of the venues we work in, we can beef up lighting much more affordably and use this to create the atmosphere we need – I’d much rather do lighting well and video tastefully yet minimally (as opposed to trying to make a big deal out of it but failing miserably). But in this case, I believe we did both video and lighting well. The LED Screen was driven by Resolume Arena 6, via a TripleHead2Go and Decimator MD-HX scalers. 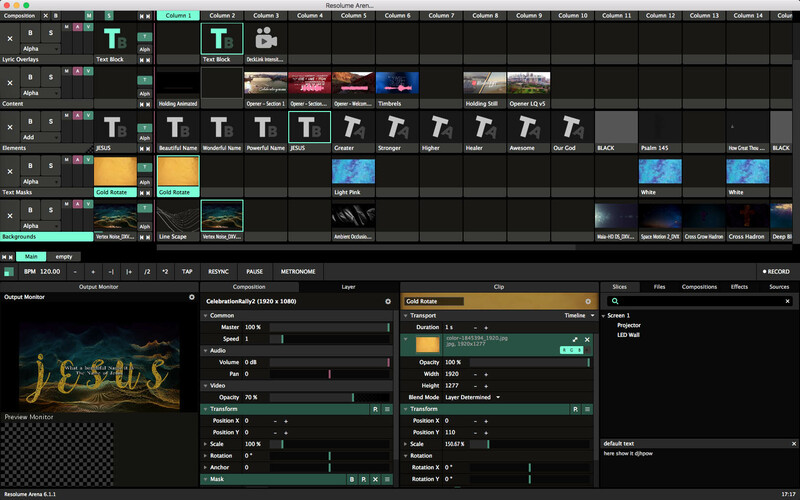 If you’ve never used or heard of Resolume before, think of it as DJ software – but for video rather than audio. Or maybe After Effects for live video. 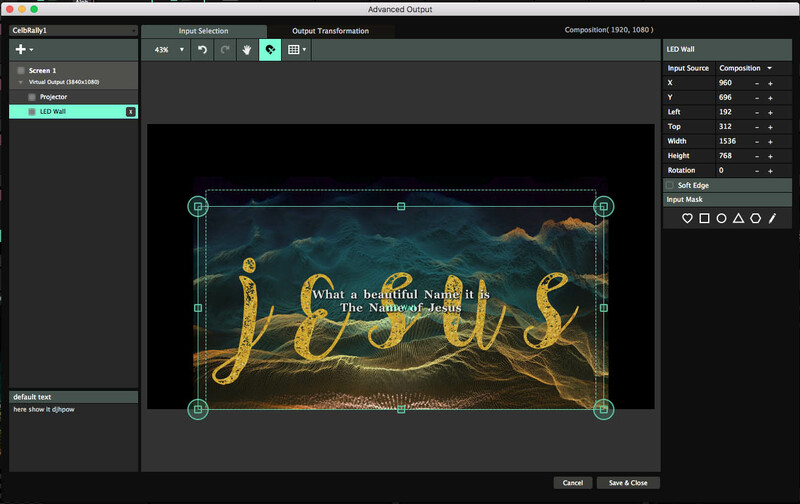 It allows you to layer videos in realtime – you can use things such as different blend modes, layer masks, layer styles, parameter animators, and in-built effect generators. 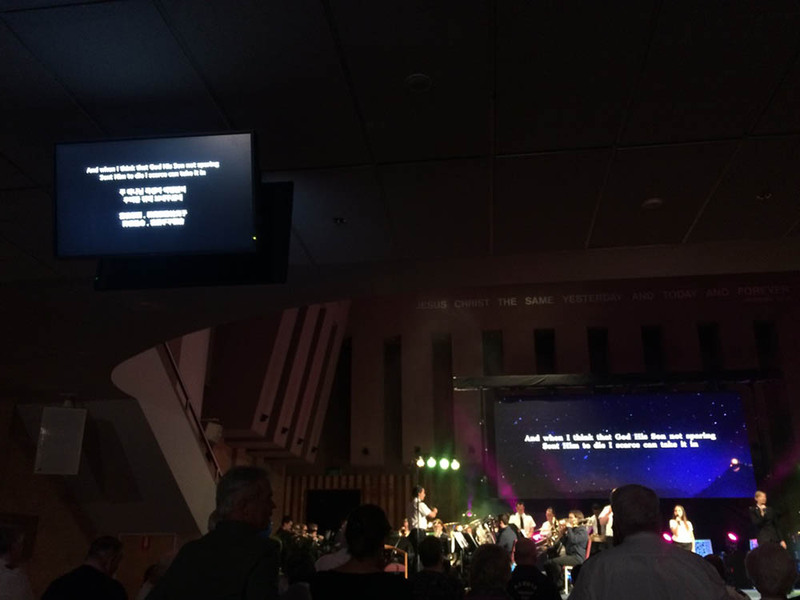 Lyrics were fed from ProPresenter 6 into Resolume Arena via OSC, using my custom software to connect ProPresenter’s XML output to the OSC input in Resolume – this little bit of software gave us a huge amount of flexibility when producing and distributing content. We also had a Blackmagic Intensity Shuttle as a backup input from ProPresenter. I produced the majority of the video content, using a mixture of pre-produced worship & VJ backgrounds, stock footage, custom animations in After Effects, and generative content in Resolume. Some of the video content was originally produced in black & white – but tinted in realtime, allowing me to do interesting things with colour on the fly. Black and white video footage is actually a great untapped source of content you can use in the church – as is public domain stock footage (I found some fantastic ink-drop stock footage that worked great in ‘This Is Amazing Grace’). Layer opacity was controlled via an external MIDI fader wing, and I triggered most clip playback manually in Resolume. I came up against some limitations with layer masking in Resolume, but mostly worked around this by linking multiple parameters together on my MIDI fader wing. I was able to come up with some simple text animations using the in-built text blocks, and the Envelope parameter animator. 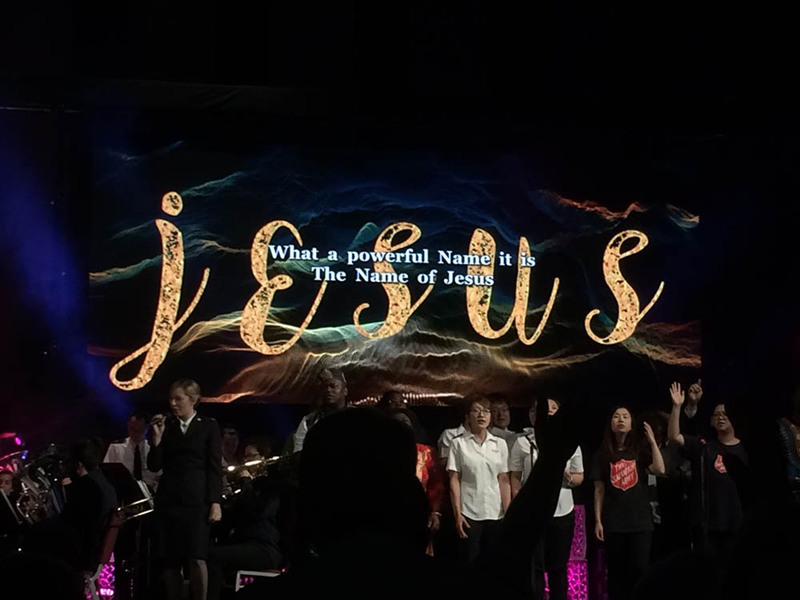 Here is a simple example of some featured text we ran during the song ‘What A Beautiful Name’. As we had to accommodate both the in-venue LED Screen, and the Live Stream, I ran two outputs from Resolume. Originally we planned to built two copies of all content and set up a 1920 x 2156 canvas – but after a bit of experimentation, we ended up designing all content to fit within both 1920 x 1080 and 1576 x 768 aspect ratios – significantly reducing the complexity of content production. I am hoping to find more ways to use video creatively more often in worship, rather than just for special events. Our big sticking point at the moment is with outputting the content – either via projectors or LED Screens. 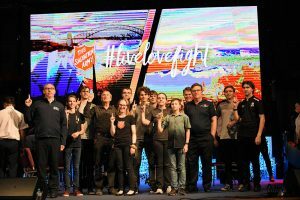 Most Salvation Army churches around Sydney would be lucky to have a 6000 lumen projector in a brightly lit room. 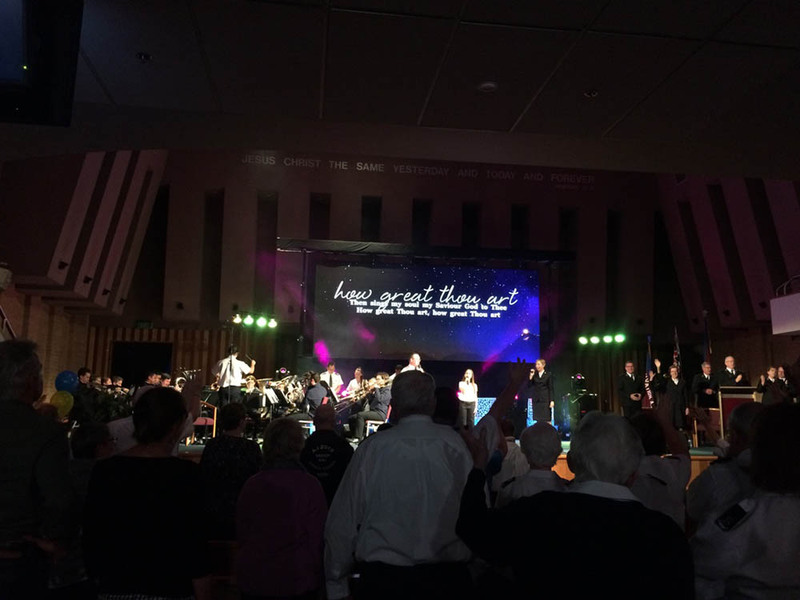 Sydney Congress Hall (our venue for this event) had something like a 30m throw on a projector that would probably only be 6-8k lumens – okay in a darkened room, but it quickly looses effectiveness as you start adding stage and house wash. 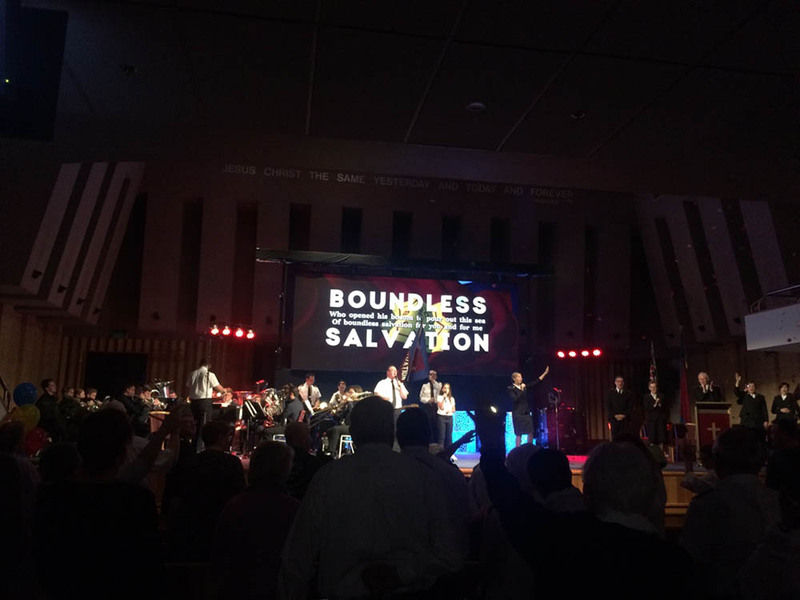 The LED Screen we used for this event would retail somewhere around the AU$60,000 mark – which is far more than most of our churches would spend on tech in a decade! That ballpack price is not counting the need for beefy PCs, software licenses, rigging, converters, cabling, scalers, processors, etc. The other issue is finding creative and competent people to work on all the elements needed to pull this off on a weekly basis. Not only do we need people to operate this tech on a weekly basis, but we also need people to produce content, design and install systems, support volunteers, etc. This perhaps is an even bigger problem, even in some of our larger congregations. These are certainly things to work on, but I’m constantly encouraged by what we’re doing on these larger church gatherings. We promoted this event in English, Chinese and Korean – so obviously we had to ensure the event was accessible to people of these languages. We setup all three languages in ProPresenter (two lines per slide – three languages all on one slide). This tri-language feed was sent to the under-gallery TVs, and those speaking Chinese or Korean were seated in the area where these TVs are visible. Wireless earpieces were used to translate the spoken components of the meeting. 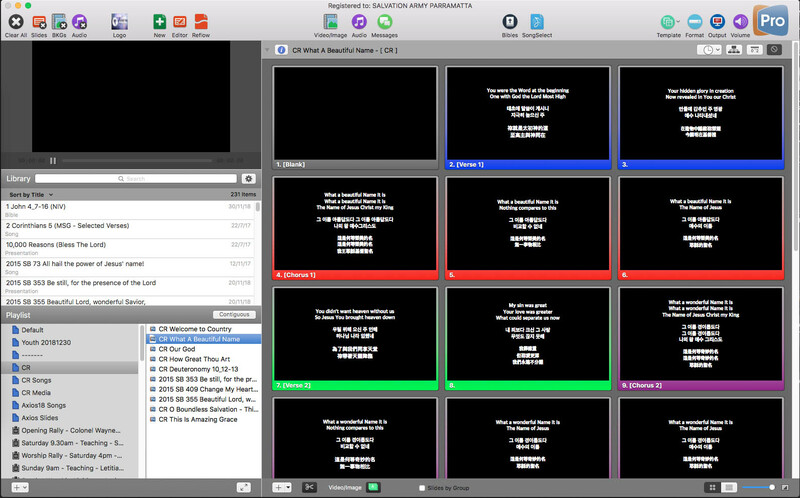 We took the English lines only and sent these to Resolume – using modified versions of my open source ProPresenter Resolume and Stage Display software – with the dual line-breaks in the ProPresenter slides being used as a delimiter. There are different approaches to translated lyrics in churches, and much of this comes down to congregation makeup, available technology, and personal preference. A popular method is to use the Master/Slave module in ProPresenter – allowing different PCs to hold each language, and be controlled by the main PC. I’m fairly sure my method of using text delimiters and XML feeds is new – and hey, it seemed to work! Everyone love some good event photos. Some photos are from Greg Donovan, and the blurry ones are from my fantastic iPhone 5S (If I keep it long enough, I’m sure it’ll become retro). There are more photos on the Sydney Congress Hall Facebook page.